One of the first things we noticed while inside the farm is—“where’s all the dirt?” There is no dirt! It’s a completely hydroponic farm. The microgreens are grown in big stackable trays that allows Local Greens to use as much vertical space as possible. Rather than using dirt (like traditional sprouts), they line the trays with jute, which gives the roots a place to anchor. It was quite incredible to see how much produce they can grow in such a small space. Ron & Faye are strong advocates of sustainable farming. Local Greens currently uses less water than a single family household and only 1% of the water used at an average produce farm. The vegan kelp-based, nutrient-enriched water is cycled through the trays several times, which ensures the greens absorbs as many nutrients from the water as possible. Local Greens refreshes the water regularly, but the cycling helps them minimize their water usage. As for other waste, Faye told us they rarely ever fill up their trash bin because everything gets reused. 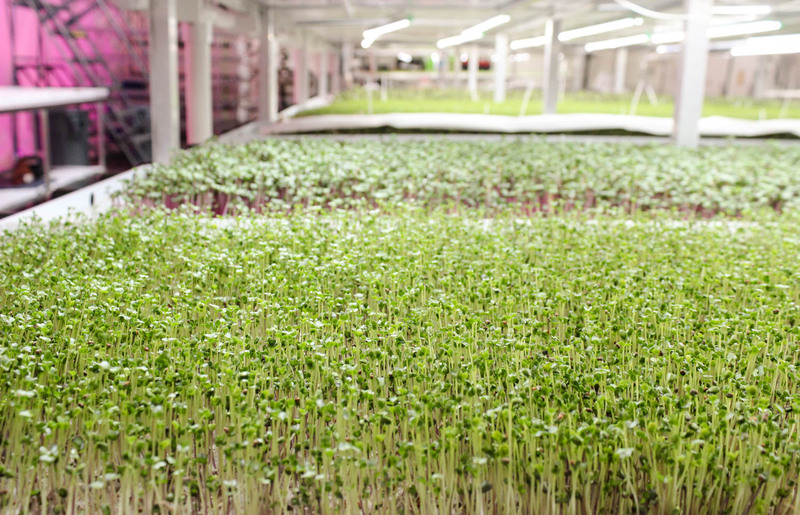 Local Greens grows microgreens in the warehouse year-round because they aren’t affected by environmental changes. To feed the plants, they use LED lights which gives them complete control over the amount of light the plants get. Ron has been experimenting for over 30 years now to find the perfect level and type of lighting to grow these delicate plants. Although the LED lights are very energy efficient Local Greens is striving to become even more eco-friendly, “We’re working on getting Solar, and once we get that we’re a complete closed system,” Faye says. 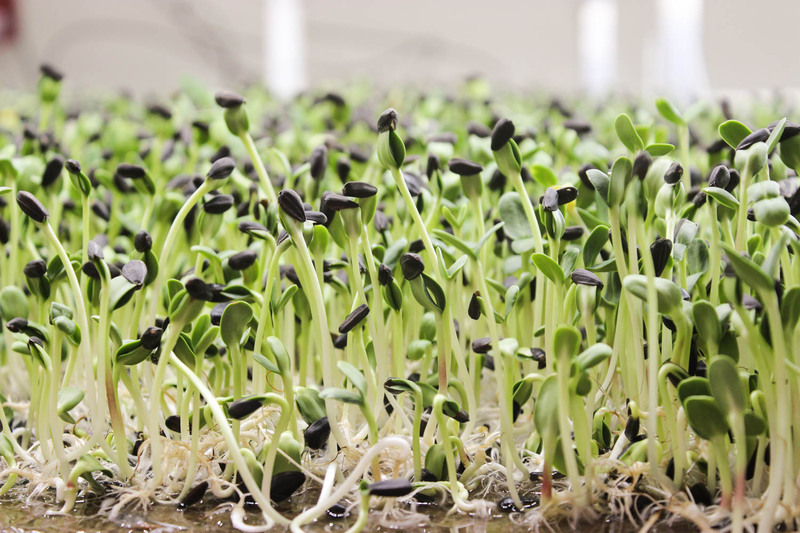 Microgreens are harvested just before the plant grows leaves. This is when they are still super nutrient dense because they haven’t used their energy to grow leaves yet. From seed to harvest only takes 10 days, how neat is that? 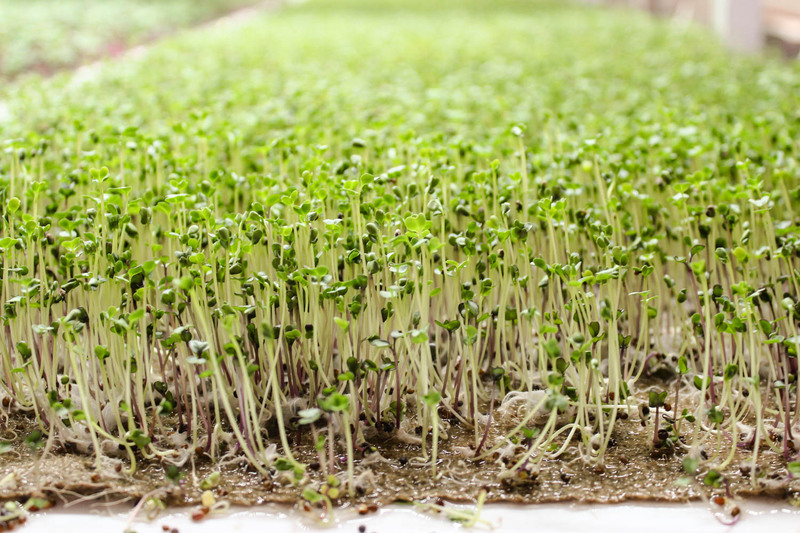 Unlike sprouts, microgreens are cut off from their roots and packaged (sprouts come with their roots). Faye and Ron explained that seeds store up all this energy in order to grow and once they sprout they release the most energy they will ever release. This energy gets used up as they continue to grow, so they are their peak nutrient level at the 10 day mark, right after they have sprouted. After harvesting the microgreens, the 12 person team takes care of all the deliveries to commercial customers themselves. They only supply grocery stores within a 20 mile radius of their farm, so what you’re getting is truly fresh and as local as it gets! Local Greens’ goal is to have multiple alternative farms in urban centers that supply the surrounding areas. They’re also working on a kickstarter campaign to help fund their new lettuce production. They’re a small, passionate, resourceful startup and we love it! The Microgreens Thriving Under the LED Lights.